We've been having quite the warm fall here in North Carolina. The mornings are chilly but things warm up into the 60s in the afternoon sunshine. Now that Thanksgiving (my favorite holiday) is past, it is time to pull out the Christmas decorations. I got the outside lights up yesterday (note to self - take that pumpkin off the front porch) and today I'll start some indoor decorating by pulling out the Christmas quilts. Every year, I make something new. My new mini for this year is this cute ornament table runner. There are many patterns for ornaments around - I didn't use a specific pattern but just based it on a smaller version I'd made previously. Each ornament is 4 '' finished and leftover charms were perfect. Organic wavy lines for the finish - I just love it! I just love that quilt. I've plenty of Christmas fabric - maybe I ought to make a larger version and have something ready to go for next year? Next up - priority shifts to gift making! More on that soon. I'm very excited to introduce you to today's designer and sponsor, Annie Unrein of Patterns by Annie and ByAnnie.com. You may already used ByAnnie's Soft and Stable product to add great stability to your bags. Annie has been designing and teaching since 2000. Her quilts and designs have been published in Fons & Porter's Love of Quilting, Quilt, Quilter's Newsletter, and Memory Makers magazines. 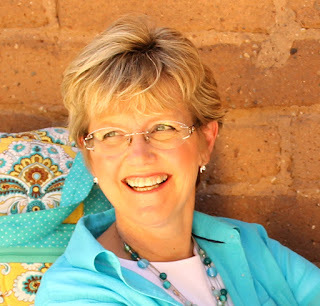 Annie is the creator of ByAnnie's Soft and Stable®, an innovative product she designed to add body, stability and a professional finish to purses, bags, home dec items and more. 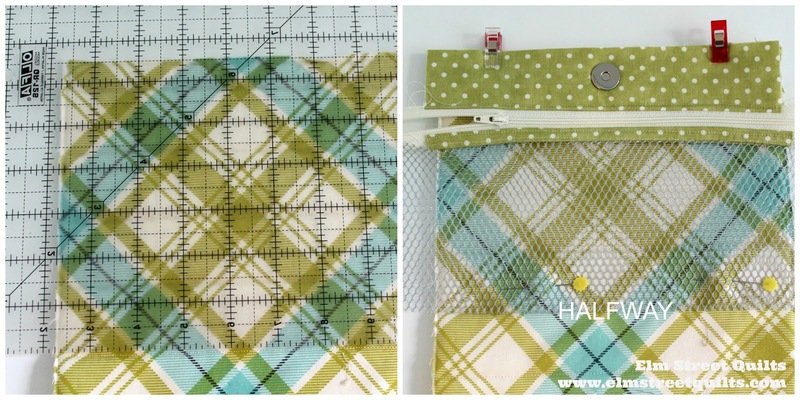 With a focus on practical and useful projects, Annie's patterns appeal to sewists of all ages and levels and serve as a great base for classes. Annie's goal is to write patterns that are easy to understand with complete instructions to guide you every step of the way. A popular Craftsy instructor, Bernina Ambassador, and offical Superior Threads Educator, Annie has a broad range of information to share from using the proper supplies and equipment to easy techniques that give professional results. Find Annie's patterns, tutorials, and products at her website www.ByAnnie.com and connect with her on Facebook and on Instagram. Earlier this year, Annie was a guest on Abbey Glassenberg While She Naps podcast and she discussed how she designed and brought Soft and Stable to market. It's a great interview. Annie has donated $25 gift certificates for two (2) lucky participants. I made my Get Out of Town Duffel bag over several days and really appreciated the paper tabs to mark each of my pieces. Instructions are easy to follow and there are helpful videos on Annie's site to get you through some of the trickier steps. I've taken my duffel bag on two trips so far and have been thrilled on the amount of clothing and stuff I can fit inside. These ducks, however, not so thrilled with my photo shoot. They made their annoyance heard. The fabric I used for the outside of my bag was Moda Sweetwater Elementary. 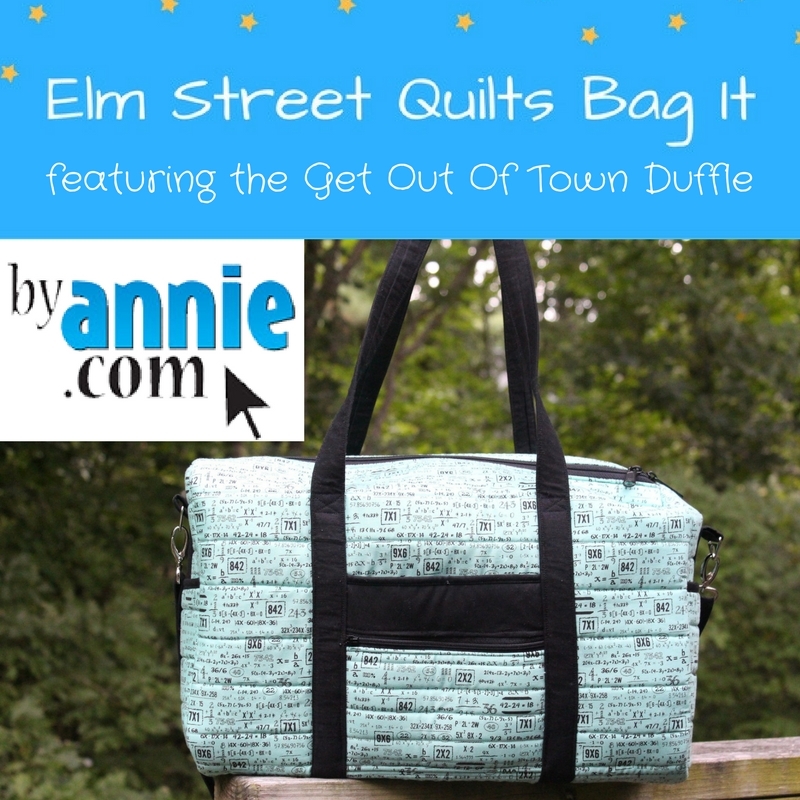 Thanks Annie for supporting the Elm Street Quilts Bag It 2017 event! Ready to link-up your November finishes? And don't panic, link-up is open until 11:55 pm EDT on November 30! My goal for November was to get my Splendid Sampler quilt basted and get the FMQing underway. I paced myself across several sit-down sessions at my machine and got the quilting done! I varied the quilting block by block and enjoyed the challenge of deciding what to do. More photos coming once the quilt is trimmed and bound. Now it is your turn to link up - share your goal finish for November. Please only link up if you finished your goal and if you also participated in the November Goal Setting Link-up. 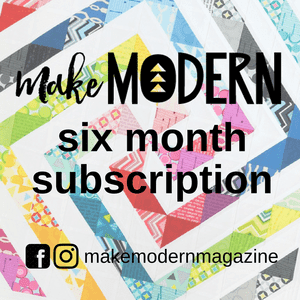 There will be three winners this month - Fat Quarter Shop is offering a $25 gift certificate, Make Modern Magazine is offering a 6 month subscription to their digital magazine and Alyce from Blossom Heart Quilts is offering a set of her making merry patterns. Winners have been notified by email and accepted their prizes! Have you been making bags? 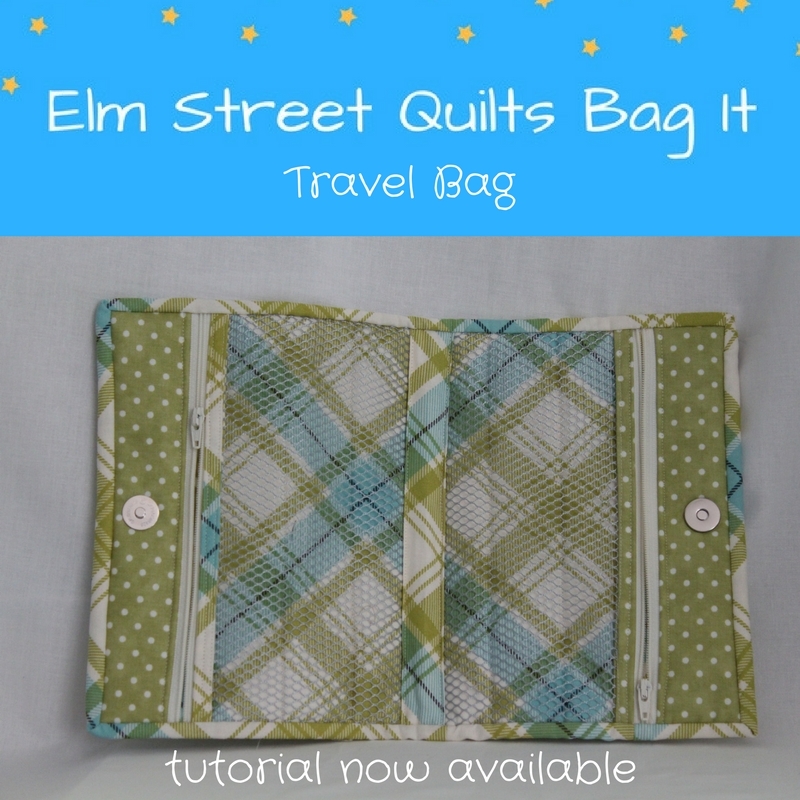 Well over 200 bags have been shared so far in the link-up (below) or on the Elm Street Quilts Group Facebook page. 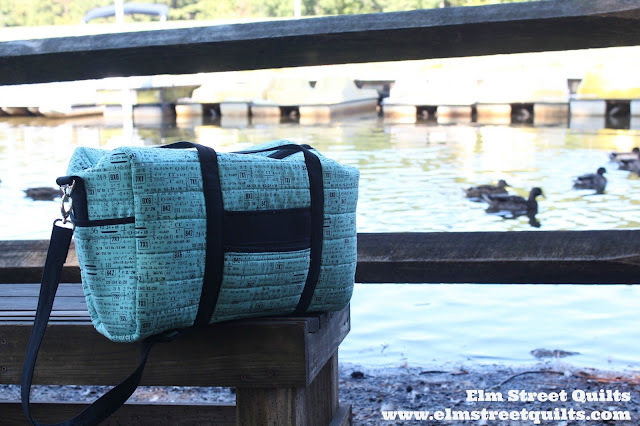 Next new Bag It post will feature the beautiful travel bag designed byAnnie. I made this in time for our family vacation this summer and really enjoyed the opportunity to use it. When I want to make a small gift for a friend, my go-to is a zipped bag. These bags are fun to make and give you the opportunity to use some pretty fabric. You can make them in all different sizes - with or without boxed corners. My basic tutorial for making a zip bag can be found here . For the bags shared in today's post, I just changed the dimensions and started with fabric cut 9 x 7''. Corners were boxed at 1 ½ '' using this tutorial. For my second bag, I wanted it to be extra special and useful so I added a pocket made from mesh for inside the bag. I cut the mesh slightly bigger than I wanted the pocket to be and then trimmed it down later. Here is how I added the inside pocket. 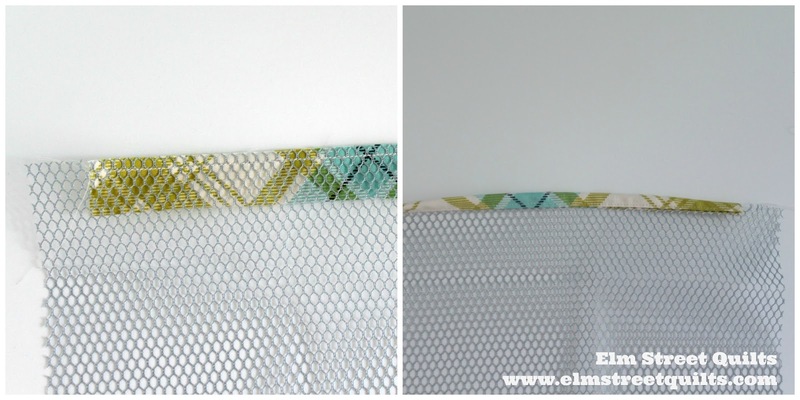 To top edge of mesh, sew a 1 ½ '' strip of fabric, folded in half, WST. Positioned the pocket 1 ½ '' from the top of the lining and pin. To finish off the bottom of the pocket, place a strip of lining fabric (2'' by width of the pocket) right side down aligning with the bottom of the pocket. Sew. Flip the strip of lining fabric down and then stitch the side seams 1/8'' from edge. I wanted my bag to open as wide as possible so I followed Noddlehead's tutorial for zipper installation part for the Open Wide Zipper Pouch and used a 14'' zipper. Both of these bags were made exactly the same way except for the zipper installation. The benefits to the zipper hanging outside the bag? The bag really opens wide. See the difference? Remember these start from the same 9 x 7 panels and are both boxed the same. The dark blue even fits inside the light blue! I won't scare you with the count down for the holidays but it is coming fast. Perhaps some zipped bags are in your future too? Fill them with gift cards, candy or maybe some sewing supplies! 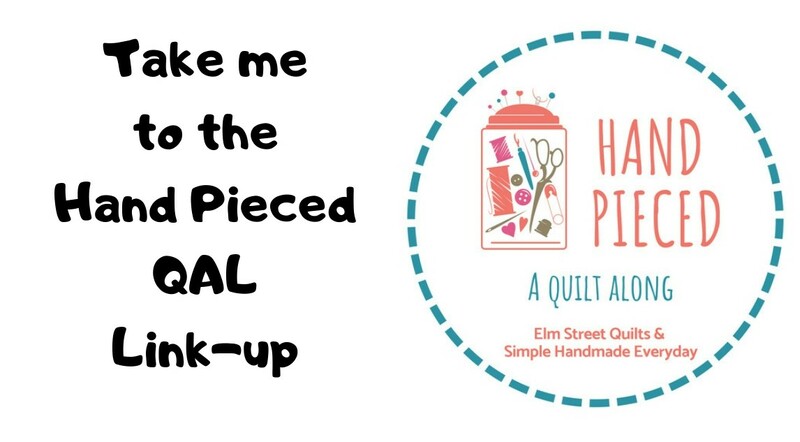 Welcome to Elm Street Quilts and my stop on the blog tour sponsored by Quiltmaker magazine! I live in beautiful central North Carolina and love the great weather and friendly people. I don't actually live on Elm Street though. My grandma did. My grandma was a knitter and taught me to knit and I credit her for my eventually becoming a maker. (I still remember that first scarf - it was white and filled with dropped stitches.) 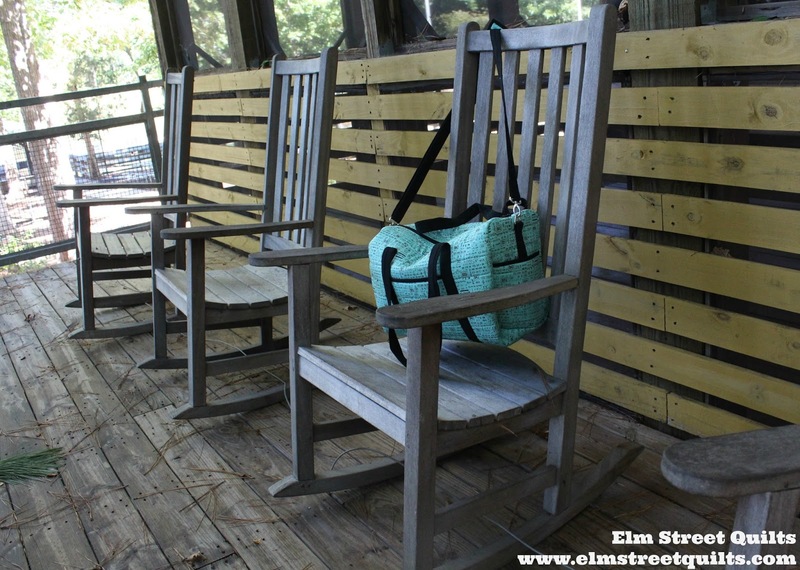 I have such wonderful memories of my visits that I named my blog and my pattern company Elm Street in honor of my grandmother. I've been quilting for 15+ years and blogging for the last 7. First time visitor? Make sure you check out the monthly link-up called One Monthly Goal with great prizes from awesome sponsors. 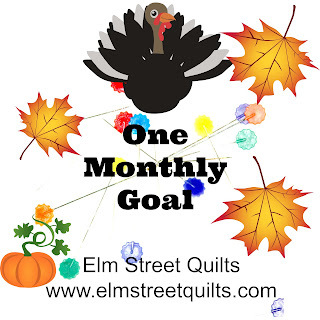 Link-up your goal - a quilt finish, make 3 blocks etc - at the start of a month and return at the end of the month to link-up your finish. Running now through mid-December is the annual Bag It event - make and share bags, earn chances to win great prizes. See more information here. I am thrilled to be part of Quiltmaker's 100 Blocks, Volume 16. This is my very first quilting publish of any sorts and I'm quite excited. I've made the block in two colorways so far and love this mini. I faced the mini-quilt instead of binding and really enjoyed the using both gray and yellow-ish thread to bring the colors to both sides. - I first set the block in a traditional grid. Flipping the block around gives you fun diagonal strips. This 3rd one is my favorite - I love how the triangles are swimming in the white area. 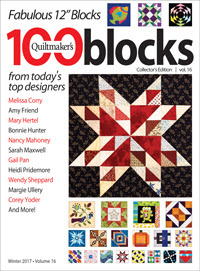 Prize 1: Quiltmaker is sponsoring the giveaway of a copy of Quiltmaker's 100 Blocks Vol. 16 to one lucky person. International entries are welcome. Quiltmaker will ship directly to the winner. 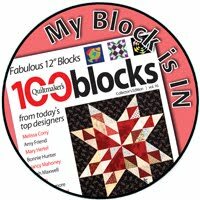 Prize 2: I will mail a copy of Quiltmaker's 100 Blocks Vol. 16 to one lucky person. International entries are welcome! Make sure you visit The Quilting Company (Quiltmaker) for additional chances to win a copy of the magazine plus other great prizes. You will also find links to other blogs participating in the hop and a chance to win additional prizes. To see all the 100 wonderful blocks in this issue, check out your local newsstand or visit Quiltmaker's on-line shop. The giveaway will run through Wednesday, November 22, 2017. While I normally respond to every comment, I may not be able to respond to giveaway comments. Winner will be notified by email. My flower block! The clue for November from Cheryl's Magnolia Mystery involved sewing together all of the blocks made in September and October. I'm downsizing the blocks by using the instructions for the lap size quilt but making the blocks smaller. My flowers measure 3 1/2'' square. 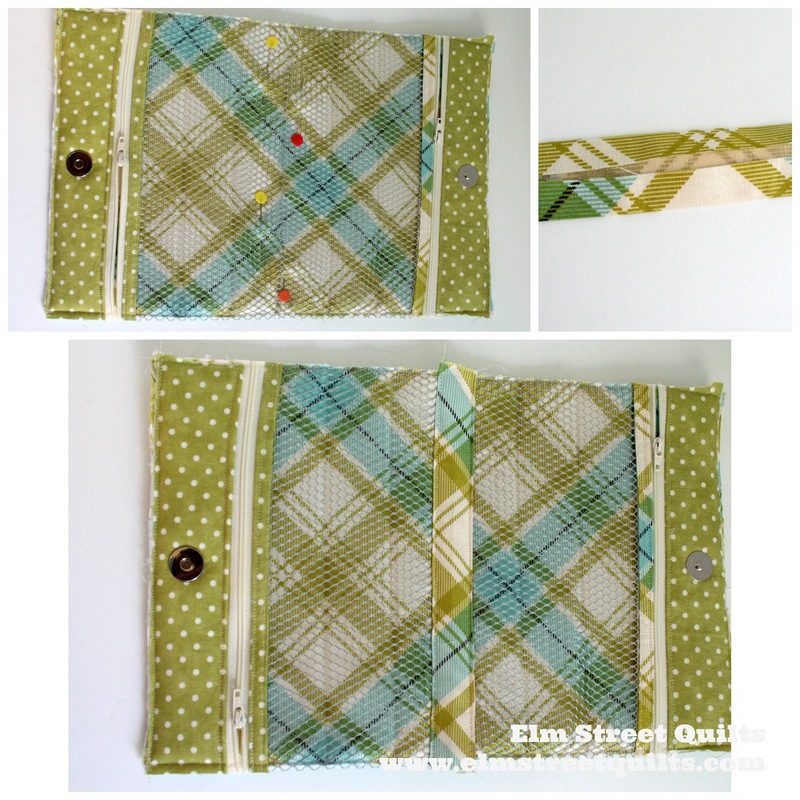 The fabric is from Paintbrush Studios solids in colors Frolic, Aluminum and Cadet. For Mellissa's Roundabout. I'm making a 2 x 2 block quilt and using a fabric line was designed by Amy Ellis for Moda. Since I'm downsizing this one too, I ended up hand-piecing my drunkards path blocks since this little ones are 2'' unfinished. I'm having fun playing with solids and Yvonne's Wayward Transparency QAL. I am using three solids from American Made Brand with the primary color being the darkest shade. I'm also downsizing this one! And now look - there be blocks here! Finally, it's that time of year for the Bonnie Hunter mystery. I'm going to play along again this year but giving myself two constraints. (1) From stash only, with the exception of any needed neutral and (2) make it baby sized. I don't know yet if it will be baby sized because I'll be making a smaller number of the blocks OR because I'll also downsize those blocks. Decisions, decisions! 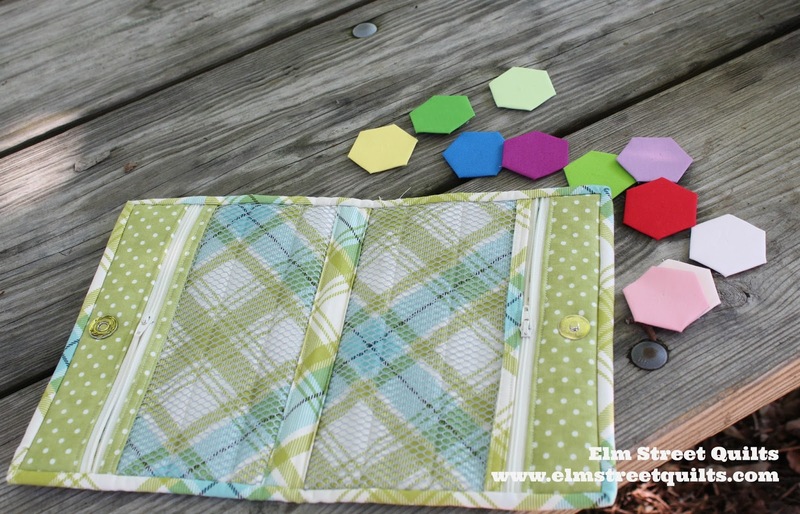 And this bag has so many uses beyond travel - use it to corral those quilting hexies! Following manufacturer's directions, iron two sheets of fusible fleece to wrong side of main fabric front. Lay this unit on top of the wrong side of main unit back to create a quilt sandwich. Mark the half way point and sew a straight line across unit. Quilt lightly. My bag was straight line quilted with the walking foot 1 ½ '' apart. 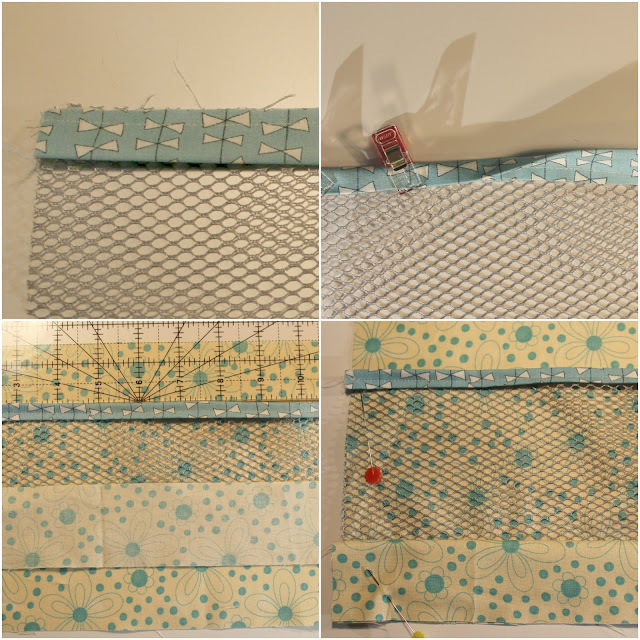 Sew a line of stitches around all four sides to secure edges. Trim off any rough edges if necessary. Once trimmed, measure from top edge to line sewn at halfway point and make note of measurement. This will be the measurement we will use for the mesh pocket. Following manufacturer's directions, iron fusible fleece onto wrong side of tab fabric. Iron a 2'' fusible fleece square in the center of unit. Following tutorial for magnetic snap installation, place one snap in the center of tab unit. Repeat for steps for second fabric tab. 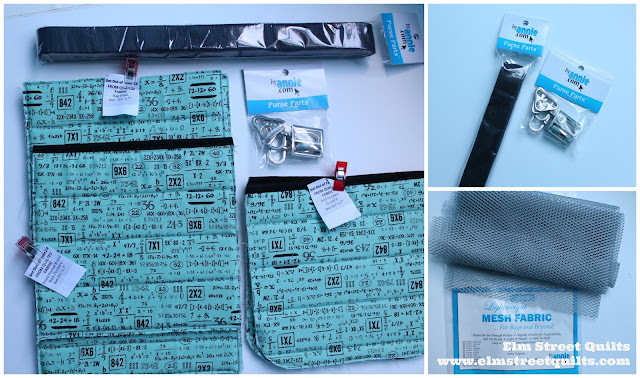 Note: Magnetic snap can be installed after tab unit are mesh units are attached to zipper. Finger press binding fabric for mesh in half, wrong sides together. Lay mesh edge on top, aligned with raw edges of binding. Sew. Wrap binding around raw edges and top stitch. Repeat for second mesh piece. Sandwich zipper between lining and tab unit along top edge of zipper tape. Zipper pull tab should be off the left and zipper should over hang each side of tab unit by at least an inch. Sew across. Lay flat and top stitch. Lay zipper right side up and place mesh on top of zipper tape along the binding. Sew across to secure. Measuring from top of tab to mesh and cut unit so that it matches the mesh pocket measurement calculated in earlier step. Lay pocket unit on top of main unit, aligning top edges. Mesh and zipper ends will hang off of each side. 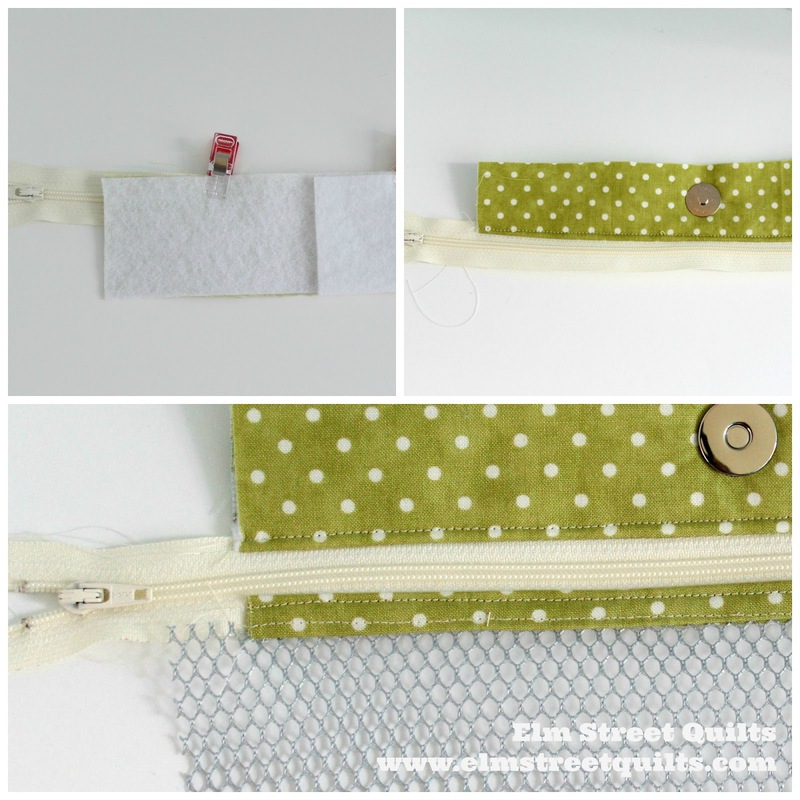 Secure top edge with binding clips. Move zipper tab to center of zipper. Sew across top of pocket at a seam less than ¼''. Sew down right side of pocket starting at top edge. Repeat on left edge. Trim off excess zipper. Turn unit and repeat for second pocket. Fold under edges of accent tab to center on wrong side and press. Lay accent tab across the center line stitched earlier. It will cover bottom edges of both pockets. Top stitch across on each edge. 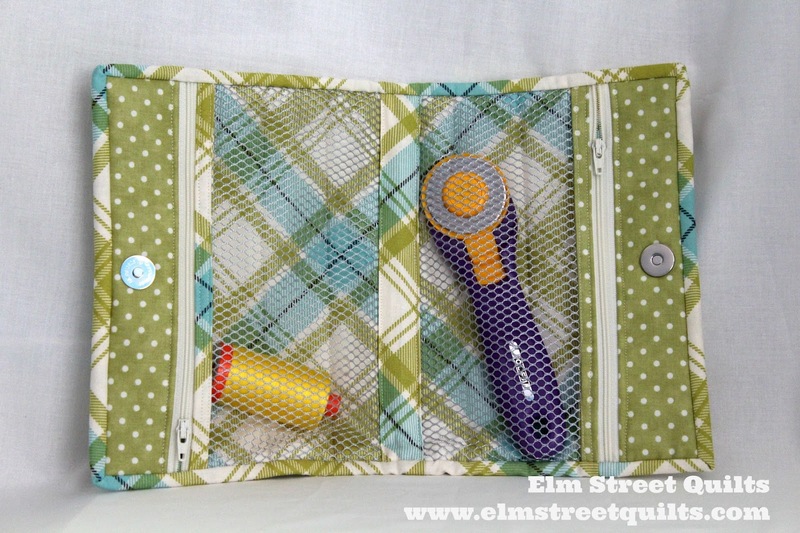 Adhere binding around mesh bag as you would a quilt. Once sewn, fold towards back and secure by hand or machine. The finished bag is 9 x 6 1/2 '' when folded. Fill with whatever you need to carry!